Peel, halve and finely slice the onions. Melt 75g butter in a large, heavy-based pan (which has a lid), over a low heat. Add the onions. Cover and sweat very gently, stirring occasionally, for 15 minutes. Uncover, turn up the heat, sprinkle in the sugar and cook for at least 45 minutes, stirring regularly, until the onions are tender, golden brown and quite dry. Meanwhile, make the croutes. Rub the outside of the baguette with the cut garlic clove. Cut into 16 slices and lay closely together on a buttered baking sheet. Drizzle over the melted butter, strew with most of the cheese, and bake for about 15 minutes until golden and bubbling. Leave to cool. When the cheese is hard and the bread crisp, you will need to carefully separate the slices as they will be stuck to each other with the cheese. 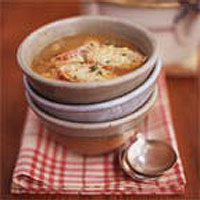 If you are making the soup a day in advance, you can keep the croutes in an airtight container. Alternatively, make them the following day before you reheat the soup. Bring the stock to a simmer in a pan. In another, small pan, melt the remaining 25g butter. Stir in the flour, add two ladlefuls of hot stock and whisk until thick. Stir this into the remaining hot stock. When the onions are ready, add the cider or wine. Cook until the liquid has evaporated. Pour the thickened stock over the onions. Stirring constantly, bring to a simmer. Cook, uncovered, for 30 minutes. Add the brandy or whisky and season well. If possible, leave the soup to mature for 24 hours. To finish, preheat the oven to its highest heat. Reheat the soup, if necessary. You can then either leave it in the pan or decant into heatproof bowls. Either way, arrange the croutes on top. Strew over the remaining cheese. Bake for a few minutes until the cheese is bubbling. Serve immediately.